I like many others didn't have A/C working in their 2GR and after reading through a ton of stuff on the problems a difficulties of doing it finally found the answer (in several places) and I wanted to put it all out here in one post for easy reference for others. I give credit where credit is due to those that did all the hard work. 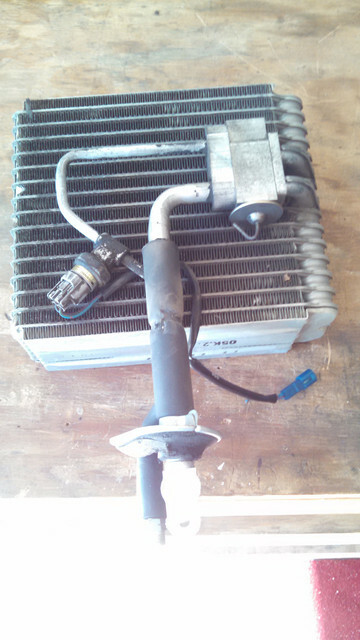 Let me start by saying that the previous owner removed ALMOST EVERYTHING of the A/C system from the car. So needless to say I had to source it all. Everything below in green I had, to include the evaporator and electrical bits under the dash. The red stuff I had to find and buy. Once everything arrived I began to install it all. 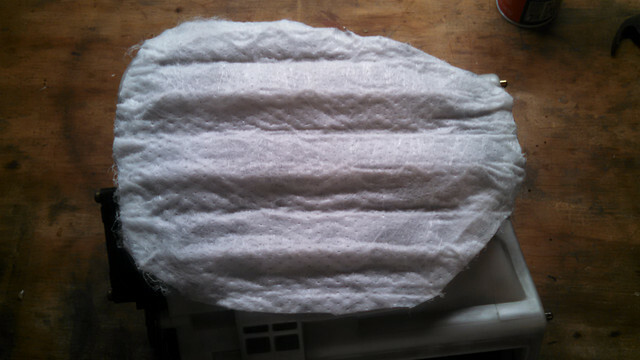 I decided to replace the evaporator as well so while I was at it I decided to try to make a cabin filter. The foam in the blower housing literally turns to dust after all these years and I was also tired of my dash being covered in dust everyday even after wiping it all the time. I'm sure some of you have noticed foam dust in your floor, on the dash or been hit in the face by a piece at some point. 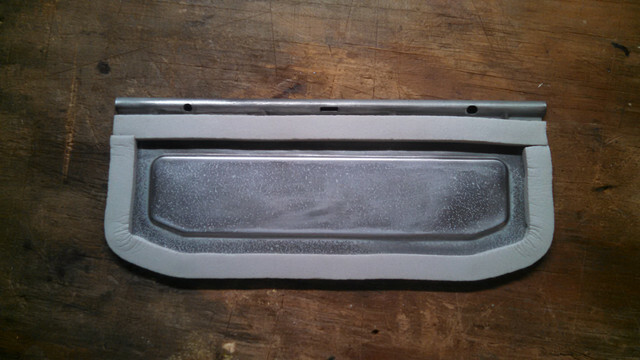 The blower fan cover was covered in rust so I sandblasted it and repainted it. 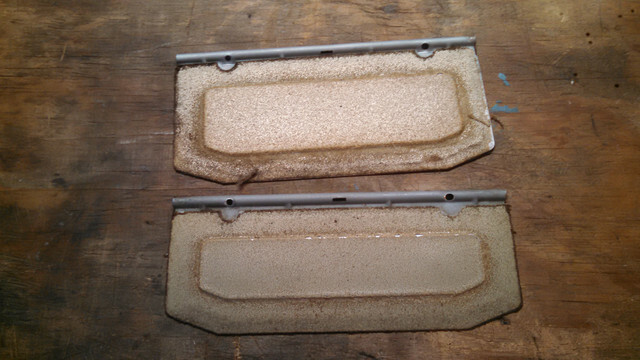 Then I cleaned all the crappy foam off the louvers. I simply ran them under my wire wheel on my bench grinder to get the rest of the old adhesive off. 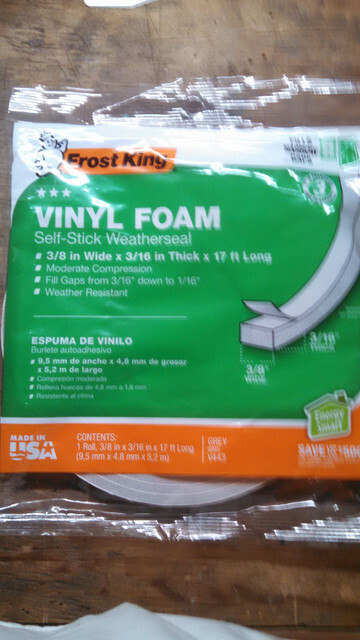 Then I needed to add foam back so they would seal so I went to Lowes and bought this. I got it in 3/8 but the next width up would have worked better for the housing opening. 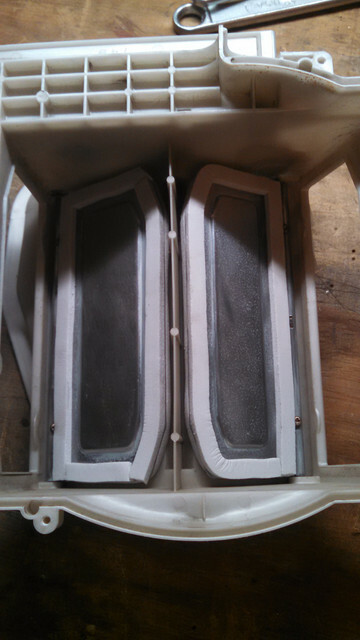 Then I simply put it around the edges on both sides of the louvers. Last edited by zdunlap; September 20th, 2017 at 12:03. Next thing I did was to create the filter portion. Also picked these up at Lowes. 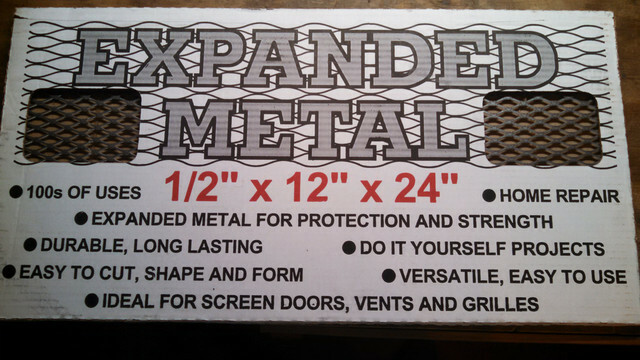 I then simply cut out a piece of the metal to fit just on the inside of the opening leaving only "tabs" to overlap the edges. I used a utility knife to trim the lip down so it would sit flush. I then cover the edge with the same foam strip I used before. 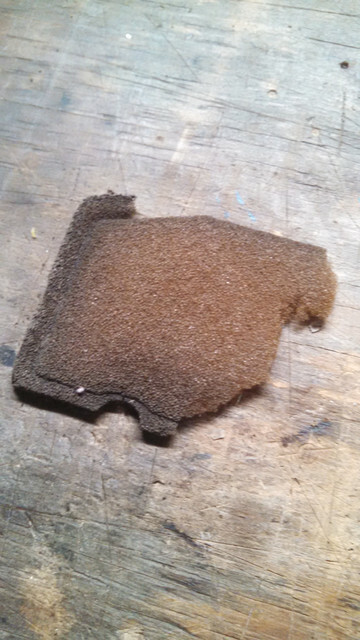 Lastly, I cut a piece of the filter and used a very light coat of spray glue on the EDGES ONLY to give it some tack. This way it would stay in place when reinstalling the blower housing. 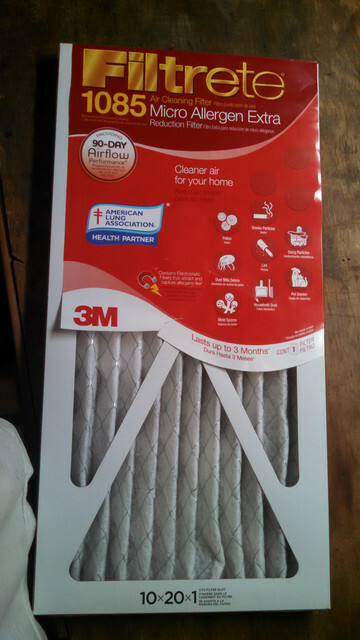 I wont use outside air too often so I figured that this filter will last me a while. 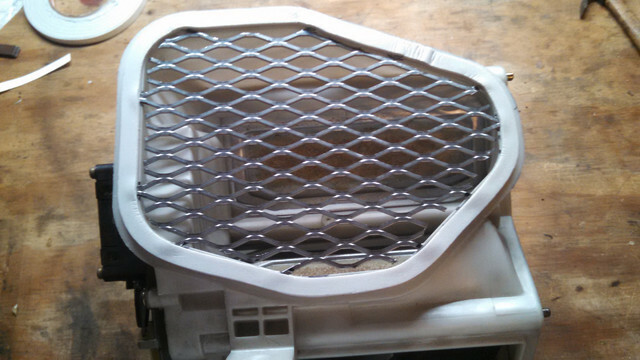 The housing is quite simple to remove so replacing the filter in the future wont be a big deal. Last edited by zdunlap; September 20th, 2017 at 11:06. So now on to the A/C. For those of you with a full system already then it's simple. I recommend replacing the receiver/drier and expansion valve. Ditch the idea that you need the 2GR compressor. There is too much trouble with the 2GR compressor as far as I'm concerned. 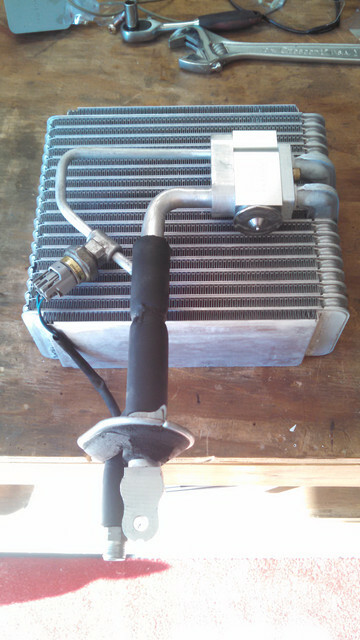 All you need to do is get a 1GRFE compressor from a 05-06 Tundra and a belt. As merryfrankster demonstrated in another thread the idle issue is of no concern with the 2GR. I've been meaning to add an update here. First I blew up two 2GR compressors in a matter of days if not hours. Then I got hold of a 1GR compressor. I have been running it for several months now (from about the time of my previous post here) and had no problem whatsoever, even with hitting my 8000 RPM limit MANY times. [Added: If this is an indication I use the a/c every time I drive the car or nearly daily and make it a policy to hit the rev limit at least once per day]. I'll add some more notes on my a/c lines later. "The suggested belt is 61.5" 7-rib v-belt. For example, Goodyear 615L7, Gates K070615, etc." Thanks merryfrankster! 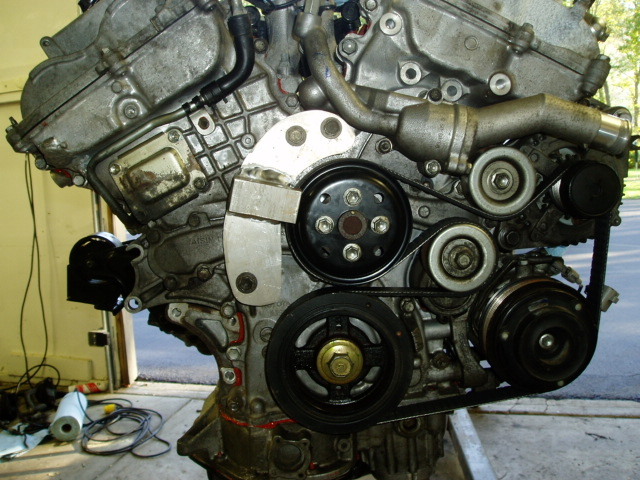 The only problem I ran into was the expansion valve I ordered was slightly wider than the stock valve. It just makes it harder to close up the housing. Not too big of a deal. Thanks Dr.Pete for those numbers!! 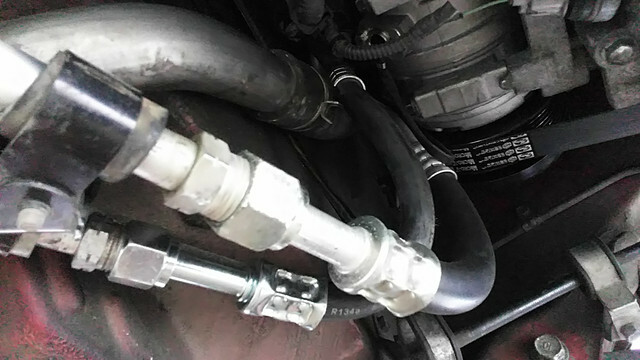 I went to a truck repair shop and he had the fittings that fit the stock MR2 lines. He let me take them home and measure up how long the hoses needed to be then I took them back and he crimped them on for me charging me only $13. I'm sure most places would provide similar treatment especially if you purchased the fitting first. Of course without a crimping tool they are just paper weights. All one can do is ask and all they can say is no right? 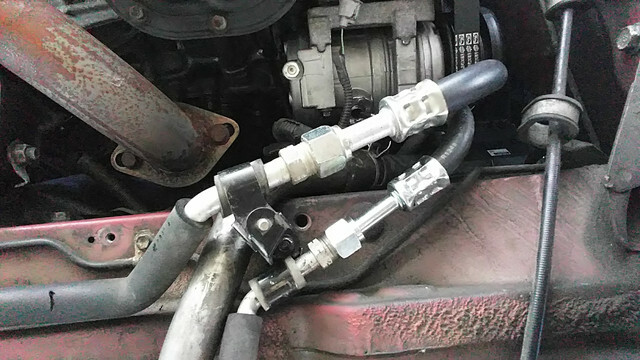 I came up with the lengths by installing the fittings on the car first. 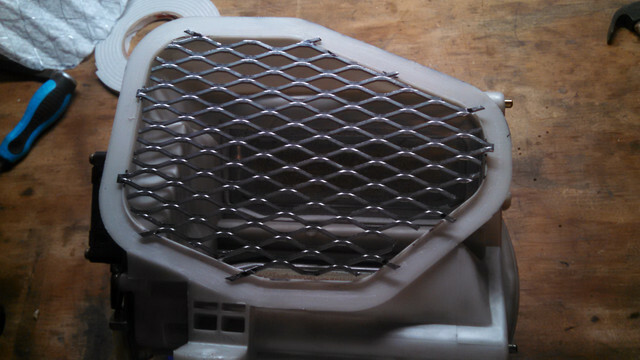 I cut the new lines directly behind the unusable fittings and then installed the lines on the compressor. I then slid the hose into the un-crimped fittings as far as they would go. I then then started trimming the hoses shorter by SMALL amounts with a test fit in between each cut until I was satisfied they weren't too long. 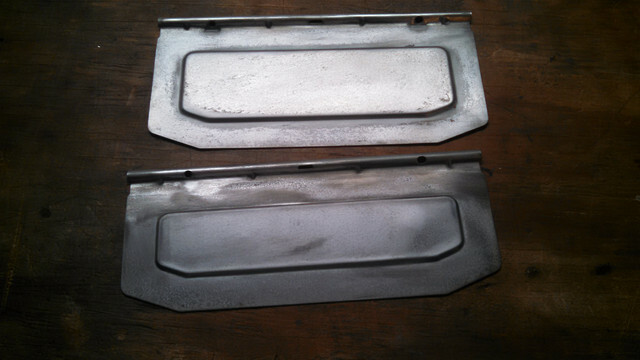 The measurements in the picture are close approximates as I measured them on the car after they were installed with a fabric ruler. I didn't think to measure them before. I used what the guy had for fittings so everyone needs to keep in mind that it'd behoove you to try to measure your own application before getting them made to prevent any headaches. I would have liked to have 45* fittings but all he had were straight. If you do get 45* fittings then you'll have to clock them before crimping them to ensure they line up nicely without twisting/kinking the hose. The plus side to using straight fittings is that there is no need to clock them at all. Simply crimp them on and they're ready to connect. 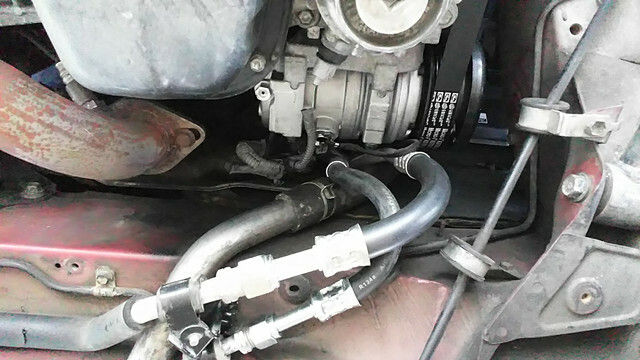 I bent the high side line VERY slightly to keep it from contacting the coolant hose after I installed it. Then all thats left to do is hook everything up, pull a vacuum and recharge. I took some advice from the Midship Runabout site and used Ester oil for the 1GR compressor. By the way you'll need 7.75 oz for it. This thing is blowing ICE COLD air!!! It is the first time in about 15 years this thing has had A/C and I cannot be happier with the way it turned out. As soon as I get a thermometer I"ll post the temp I'm getting at the vents. BryanH, JimKing, monkeyra and 3 others like this. 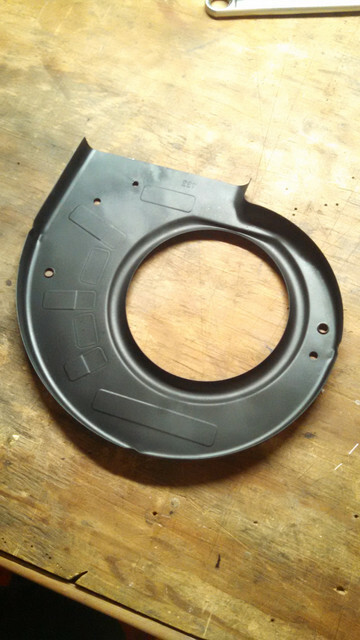 Can you post the lengths you came up with for trimming the black rubber hoses including the crimped ends? 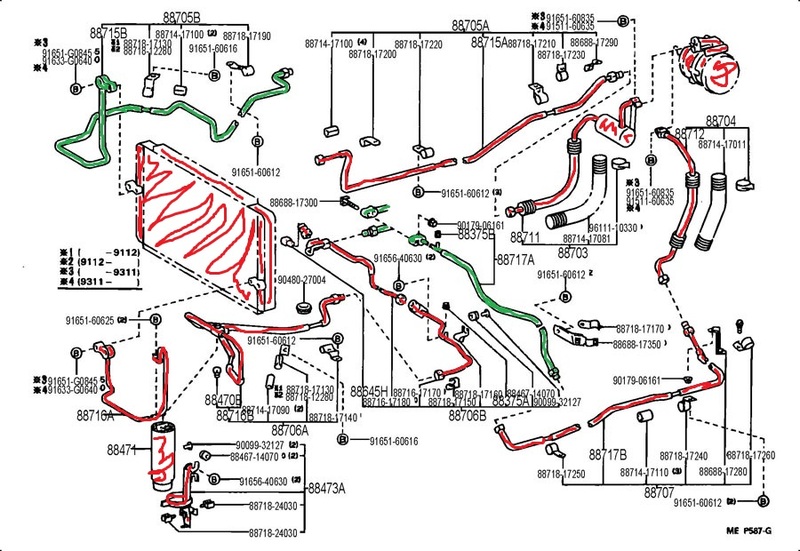 It would be helpful to have the lines made up before installing the engine. And it's important to use Esther oil and not the PAG oil, which is not compatible with the old oil in the R12 system. By using Esther oil, there is no need to flush your old system. The 45 degree high side fitting works a little better, but the hose will need to be a little shorter. Yes, I will get under there later and measure them. There you go Sir. I just added the info to the original post so it's all in one place. I also added a few pics of them installed. I hope that helps. Most people would cut the hard line fittings from their old MR2 lines (as I did) and crimp the new hoses onto them - which is a shame because it destroys a perfectly good set of lines that could be put to use in another MR2. In your case, the a/c system was deleted previously so you had to find new fittings. Those new fittings are a pretty good find. It would be great if you could come up with part numbers for those. Nice job on restoring your a/c. 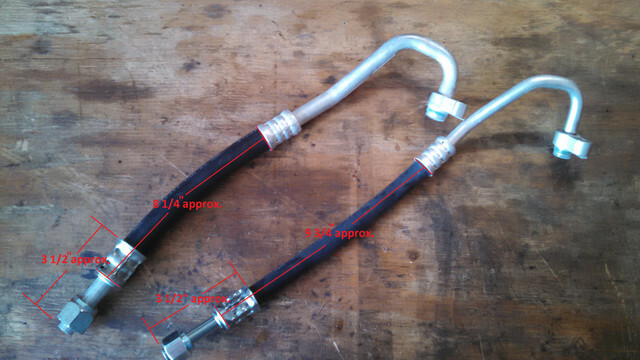 See post #4 for the hose end fitting part numbers. I added them to my original post. That 45 degree fitting should be perfect that's the angle I ended up bending mine.